General Hospital (GH) spoilers for Friday, April 27, tease that Ava (Maura West) and Nelle (Chloe Lanier) will have another chat about custody. Nelle’s facing a predicament at the moment. She knows it’d be in her best interest if Ava beats Sonny (Maurice Benard) and Carly (Laura Wright). That would boost her chances of keeping her own kid when the time comes. However, Nelle could also score major points with Michael (Chad Duell) by changing Ava’s mind. She promised to give it a shot, but Ava’s not going to budge. General Hospital spoilers say this is mainly about Avery (Ava and Grace Scarola), but getting payback is also appealing to Ava. Winning the custody battle would certainly help her stick it to Sonny. 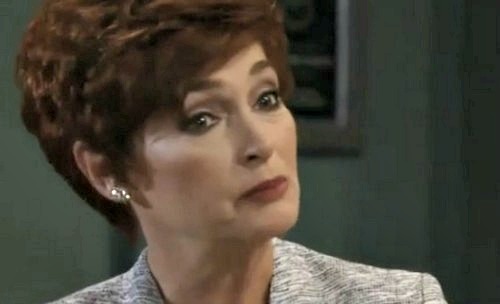 Meanwhile, Diane (Carolyn Hennesy) will share some bad news at the police station. She’ll tell Sonny and Dante (Dominic Zamprogna) that Mike (Max Gail) may not be going home tonight. GH fans can expect these three to put their heads together. They’ll be desperate to resolve Mike’s latest mess. Across town, Franco (Roger Howarth) will feel guilty about his actions as a child. During a session with Kevin (Jon Lindstrom), Franco will wish he could’ve stopped Jim Harvey’s (Greg Evigan) path of destruction. He’ll insist that Jim got a pass because he was too scared to do anything. Kevin won’t think Franco should worry about what he did or didn’t do as a kid. Jim’s behavior wasn’t Franco’s fault, but he’ll want to ease his conscience anyway. Franco will move forward with his plan to track down the other victims and provide closure. Other General Hospital spoilers say Sam (Kelly Monaco) will want the truth from Curtis (Donnell Turner). She just caught him snooping around Peter’s (Wes Ramsey) office, so she’ll wonder if there’s something she should know. Curtis may admit a few things aren’t adding up about the mysterious Peter August. At Wyndemere, Robert (Tristan Rogers) will push Valentin’s (James Patrick Stuart) buttons. He’ll try to figure out if Valentin’s in the loop on that conundrum box. While Robert works on the case, Anna (Finola Hughes) will have an emotional conversation with Finn (Michael Easton). She’ll insist that she’s not the person everybody believes she is. General Hospital spoilers state that Anna will make a confession, so it sounds like she’ll finally spill the real Heinrik details. Anna may come clean about her son and hope Finn will understand. Will her honesty change the game? We’ll give you updates as other GH info comes in. Stay tuned to the ABC soap and don’t forget to check CDL often for the latest General Hospital spoilers, updates and news.